As in his preceding books, Ness offers incisive appraisals of violence, power, and human nature, and with the series complete, it’s clear that he has crafted one of the most important works of young adult science fiction in recent years. [Ness’s] rapid-fire litany of impossible choices makes for captivating thought fodder, and what has already been a potent display of the power of voice to drive, amplify, and transform a story gets a third, unexpected soloist. And in so doing he shows just how deep and complex, as well as how versatile, a symbolic and narrative device the concept of Noise can be. . . .This is science fiction at its best, and is a singular fusion of brutality and idealism that is, at last, perfectly human. This is a complex and engrossing work that series fans will devour. With its dark tone, violence and readerly fanaticism the book belongs firmly beside Suzanne Collins's work. 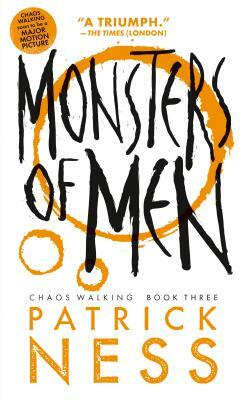 The Chaos Walking trilogy is genuinely imaginative dealing as much with questions of privacy and information overload as it does with the more self evident subject of war (The New World’s great menace is a germ that makes men s thoughts audible and visible.) Young adult readers should definitely start with the first two volumes before tackling the third, and, I’m afraid, shouldn’t expect to get much sleep until they’ve turned the final page.